Over in Frankfurt I spent some time photographing the straßenbahn network. On seeing the above tram, my thoughts went back to the Australian city of Adelaide, where almost identical trams are in service. So how are the two related? The story starts in Frankfurt in 2001, when 65 ‘Flexity Classic’ trams were ordered from the Bombardier plant in Bautzen, Germany. Delivered between 2003 and 2007, they became known as the ‘S’ class trams with operator VGF. 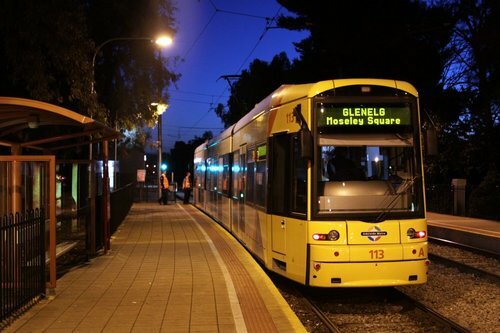 As the first trams entered service in Frankfurt, over in Adelaide the newly-elected South Australian government announced a $56 million upgrade of the Glenelg Tram. Included in the package was the purchase of modern low-floor trams, a difficult ask due to the small size of the order – only nine vehicles. In September 2004 it was announced that Bombardier Transportation has won the contract, offering to supply the requested number of trams off the back of the existing Flexity Classic order from VGF in Frankfurt. In 2005 the Adelaide order was expanded to 11 trams, to cater for an extension of the tramway into the CBD proper. 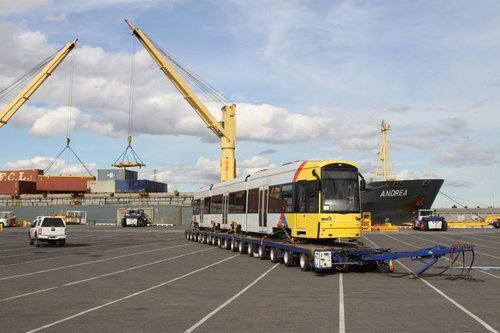 The first of the Flexity trams arrived in Australia later that year, having been transported from the factory in Bautzen to Hamburg by road, then by ship to Melbourne, where they were transported by road to Adelaide. The rest of the trams followed the same route, the final one arriving in 2007. With the success of the Glenelg Tram and the city extension, in 2008 the State Government announced a second tramway extension to the Entertainment Centre, along with an order for another four Flexity Classic trams. The new track opened in 2010, but the trams were not delivered until 2011-2012. And that is how Adelaide ended up with the same trams as Frankfurt. Once the Flexity trams arrived in Adelaide, it was discovered that the factory fitted air conditioning units were not powerful enough to cope with a South Australian summer – as a result $3.5 million was spent in 2009 to upgrade the units. 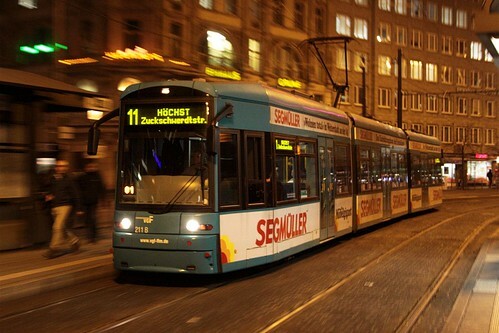 This entry was posted in Trams and tagged Adelaide, Australia, Frankfurt, Germany. Bookmark the permalink.